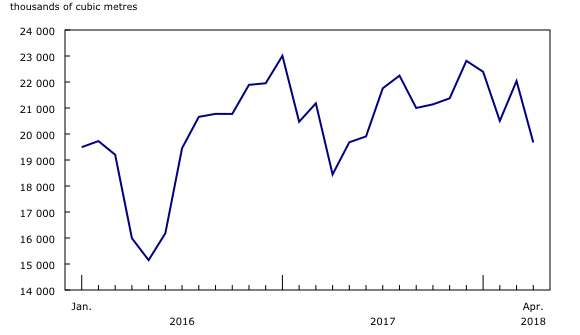 Pipelines received 19.7 million cubic metres of crude oil and equivalent products from Canadian fields and plants in April, up 6.7% compared with the same month in 2017. The vast majority originated in Alberta (85.1%), followed by Saskatchewan (11.4%). 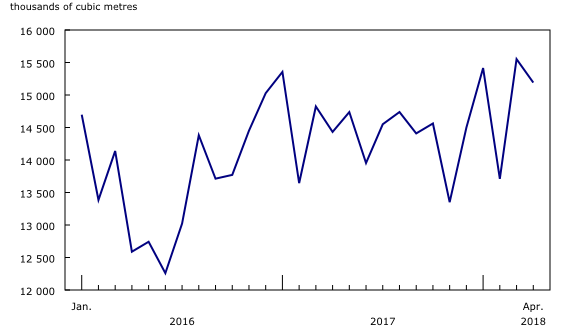 Pipelines delivered 6.3 million cubic metres of crude oil to Canadian refineries in April, down 9.7% compared with a year earlier. Of this total, 59.3% was sent to refineries in Alberta, Saskatchewan, and British Columbia, while the balance was delivered to Ontario and Quebec refineries. Pipelines exported 15.2 million cubic metres of crude oil to the United States in April, up 5.3% compared with the previous year. Most of Canadian crude oil is exported. Canada is the largest foreign supplier of crude oil to the United States. Imports by pipelines from the United States totalled 1.8 million cubic metres. Closing inventories of crude oil in April totalled 13.1 million cubic metres, up 13.9% compared with the same month one year ago. Pipelines received 2.9 million cubic metres of propane, butane, and other products from Canadian fields and plants in April. Meanwhile, closing inventories of propane, butane and other products totalled 1.3 million cubic metres. As of the April 2018 reference month, data is now available to January 2016. Additionally, data from March 2016 to December 2017 have been revised. Starting with reference month January 2018, the survey's coverage of propane, butane, and other products was expanded to improve the data quality of the program. As a result, comparisons to past estimates may be affected by the increased coverage.